Students from RMIT Sound Art & Media Arts departments, in conjunction with RMIT UNION ARTS & FOOTSCRAY COMMUNITY ARTS CENTRE, present "BEAT PROJECTIONS", a twilight open-air audio-visual event. 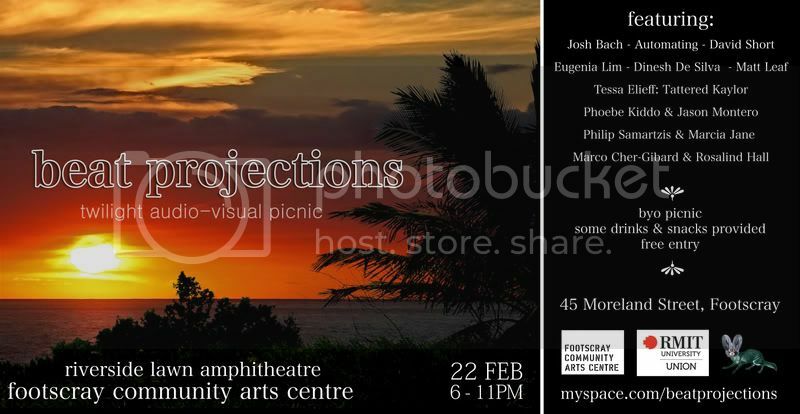 Set in the picturesque tropical/industrial surrounds of riverfront Footscray, Beat Projections will present an evening of ambient, experimental and audio-visual based performances at the outdoor amphitheater at Footscray Community Arts Centre. Kicks off 6PM on the 22nd of February, with some drinks and snacks provided. Supported by Footscray Community Arts Centre and RMIT Union. Footscray Arts is located on the Maribyrnong river bicycle path, which crosses the Footscray Road bicycle path from the Melbourne city.